The Truth about American Muslims: Half believe “parodies of Muhammad should be prosecuted criminally in the US, one in eight call for death penalty for insulting Islam, 40% say Sharia should be law of the land! 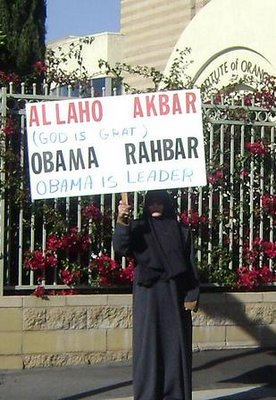 And 72% support Obama. In a poll taken by Wenzel Strategies, a public-opinion research and media consulting company, found that a sampling of Muslim American voters hold some startling (though perhaps not surprising) views; way out of the mainstream of American public opinion. Nearly half of 600 Muslim-American citizens polled (Oct. 22-26) who plan to vote in the 2012 Presidential election believe parodies of Muhammad should be prosecuted criminally in the U.S.; while one in eight say the offense is so serious violators should face the death penalty. 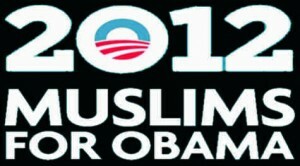 The poll found that more than 72 percent of Muslim Americans said they are definitely supporting Obama, and another 8.5 percent are leaning that direction. Only 11 percent are for Romney. Nearly 55 percent of the American Muslim voters say the U.S. is on the right track, and another 13 percent are uncertain. Virtually all of the respondents (98 percent) are American citizens and 97 percent are registered to vote. Wenzel’s poll said 7.2 percent of the respondents said they strongly agree with the idea of execution for those who parody Islam, and another 4.3 percent said they somewhat agree. While 80 percent said that they somewhat or strongly disagree with the idea, when those who said they were not sure are added, one in five (1/5) Muslims across America cannot say they believe those who criticize Muhammad should be spared the death penalty! Another interesting statistic: Four in 10 (40%) said Muslims in America should not be judged by U.S. law and the Constitution, but by Islamic Shariah law! A small percentage said they think the U.S. should establish a separate court system to adjudicate matters involving Muslims. While the respondents overwhelmingly lean toward the Democratic Party and like the direction Barack Obama, who repeatedly has praised Islam around the world, is leading this nation; they also have a fundamental conflict with American life, expressing objections to the freedom of speech and religion guaranteed in the Constitution. The poll shows that many American Muslims show signs of ambivalence toward the U.S. Constitution generally and the First Amendment specifically.These survey findings show a community in conflict with the foundations of our nation, as many Muslims favor and enjoy the freedoms offered by the U.S. Constitution, including participation in elections here; but at the same time significant percentages want to be treated differently than the average non-Muslim when it comes to legal matters. 39% of Muslims said they believe existing U.S. courts should “consult” Shariah law when adjudicating cases involving Muslims. 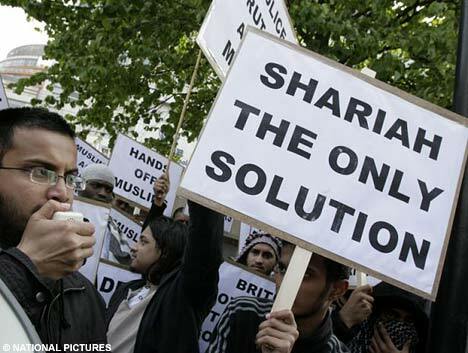 21% the U.S. should establish separate courts based solely on Shariah law to adjudicate cases involving Muslims. Answers to another question in the survey found that one-third of Muslims (32%) believe Shariah should be the supreme law of the land in the United States. One in five (20%) believe in polygamy: Muslim men should be allowed to follow their religion in America and have more than one wife. 58% favored changing the Constitution to outlaw criticism of their religion or of Muhammad. Nearly one in three (1/3) said Israel either has no right to exist or they were uncertain whether it does. Spencer has authored 12 books on Islam and has led seminars about jihad for the United States Central Command, United States Army Command, the FBI, the Joint Terrorism Task Force and others.